Sugar Creek, MO — A family in Sugar Creek, Missouri grew the beautiful vegetable garden in the photo above. They’ve been given four days to tear out the entire garden or face a fine. Why? Because it is in their front yard, and city officials and a few neighbors don’t like it. Nathan Athans said he planted the garden in his front yard because it gets optimal sunlight. His backyard only gets sunshine for about two hours per day, and only in certain areas. Athans told KSHB that he grows several different types of vegetables on his lawn and loves tending to his garden. I’d probably say about 300 hours [so far this year], I spend all my free time out here. I want my family to know where their food is coming from, I don’t want to have to go to the grocery store and worry about what was done to that food. Last summer, the city cited Athans for weeds in his garden, and he complied with the order to clean things up, and paid the fine. But now, the city has passed a shiny new ordinance – one that Athans believes is part of a witch hunt against him. 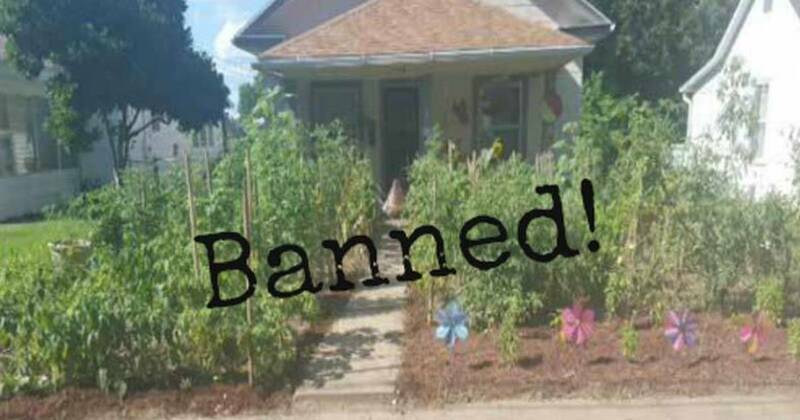 The city of Sugar Creek, Missouri passed an ordinance two days ago on March 28th, forbidding front yard gardens to grow food, within the first 30 feet of front yard space from the street. Mayor Matt Mallinson both passed and approved this ordinance. They gave us until April 1st to comply. We are the only house in the city with a front yard garden, and just happen to be exactly within those first 30 feet. They have been targeting us since we moved in last year, because we grew a garden in the front yard. The city’s building official, Paul Loving, told KSHB that city received many complaints and that the ordinance is their solution. We believe in sustainability, growing our food locally without pesticides and excessive fertilizer use, reducing our need for fossil fuels to import produce from other countries, countries that have little or no regulations on pesticide use. Sugar Creek is also prone to flooding, as it is located next to the Missouri River, so using our yard for growing plants instead of grass is beneficial because our garden takes in water as well as holding the soil together to prevent erosion, all while filtering out pollutants. It has helped our basement not flood during storms, prevented storm water runoff pollution, reduced fossil fuel use, helped us eat healthier, and prevented us from consuming pesticides and GMOs. Unfortunately, Athans isn’t the first to be subjected to harassment over growing his own food. People have been charged with crimes, threatened with jail time, and had their property destroyed for growing gardens in their own yards. Remember, in the US, you never truly own anything.